In our article 12 Volt Programmable Timer Switch, first published back in 2006, we discussed the difficulties in finding a 12 Volt DC powered programmable digital 7 day timer for a reasonable price despite the mains powered equivalent being available from as low as £5. At that time the cheapest available 12VDC programmable timer was priced at around £50-60 AND they were difficult to find and purchase. We subsequently started converting mains powered timers and thermostats ourselves and sold them here for the last five years: Converted TE7 Timer Relay. 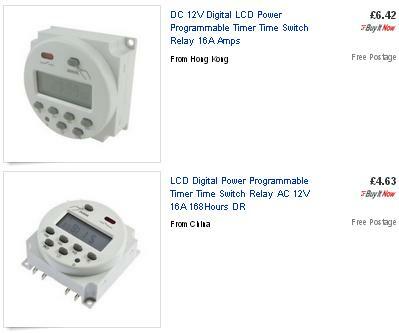 Finally, back in around 2010-2011, 12V digital programmable timers started to appear which were reasonably priced and with much improved availability. In this article we will look at one of those timers which is still the most popular of these timers on the market at the time of updating this article (October 2013) – the TM-619. The original unit is available in the UK for around £35, but almost identical timers are now available for well under £10. 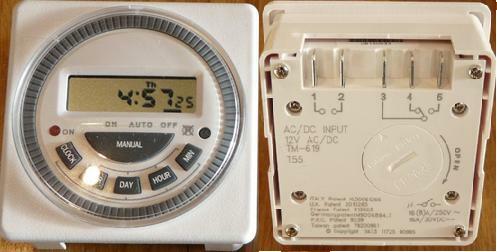 Pictured above is the TM-619 12 Volt programmable digital 7-day timer. This timer offers all the ease of programming of a standard plug-in digital mains powered timer, but is designed to powered by any 12 Volt AC or DC source. With large independent spade connectors this timer can be used to switch up to 16 Amps of current at mains voltages (up to 250 VAC) or at up to 30 VDC. The timer can be programmed with on/off times as short as one minute, and up to 8 on/off programmes per day can be set. As is common with mains powered timers, a wide selection of options are available to set on which days programmes are to be active – e.g. every day, weekdays only, weekends only, alternate days, first half of the week, second half of the week, individual days, every day but Sunday etc. Connecting up and programming the timer is very simple using the LCD (display), and the detailed printed programming instructions which come with the timer. There is also the following short instructional video available. The timer can be set to ON, AUTO, or OFF using the MANUAL button giving you complete control.<br. One additional feature is the random start up override. When this is initiated, all stored programmes are ignored and the timer alternates between ON and OFF automatically at a random intervals from 10-120 minutes. This is useful as a burglar deterrent if used to switch lights or a radio – for example, on a boat, caravan, or outhouse. So that your programmes and the current time and day are not lost when/if you disconnect the timer from its 12 volt power source, a backup CR2032 lithium button battery is fitted, and can easily be replaced if and when required. This timer is well built, keeps timer reliably, and is relatively easy to programme and set up. A clip on clear plastic cover is provided to keep dust and splashes off the LCD and programming buttons, and the rest of the unit is sturdily constructed. The timer as shown above is available from 12 Volt Timer for £36 including First Class Royal Mail UK delivery. For £45 the timer is available pre-wired with 10 metre leads terminated with heavy duty crocodile clips, and a weatherproof plastic box is also available for a further £18. To purchase almost identical timers click here: 12V Digital Programmable Timer for from just £5 including air mail postage from HK or China.